Last week I decided to take one more look at a question I had about my grandfather Albert B. Cleage’s letters to his future wife, Pearl Reed. Who was the Katy Allen at 2715 N. Capital St. Indianapolis? 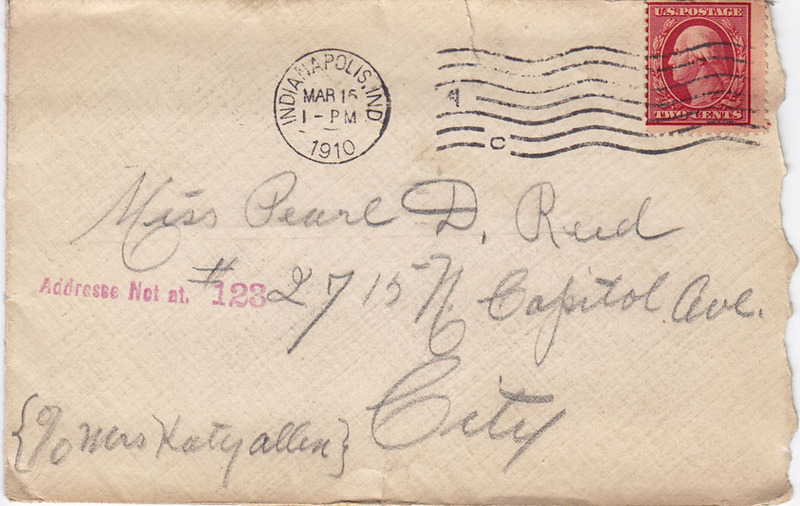 Albert sent Pearl letters there for several months in 1910. 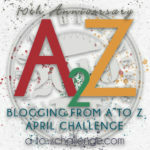 I had looked for Katy Allen several years ago when I first posted some of the letters on my blog, and found nothing. I only had her name and street address. Recently I looked again and found Katy Allen listed in the Indianapolis City Directory for several years around 1910. She was listed as the widow of Thomas Allen. I then found her in the 1900 census with her husband and then I found his death certificate from 1907 (all on Ancestry) Thomas’ mother’s name was listed as “Clara Green”. This was my great grandmother Anna’s mother’s name – which made him my grandmother Pearl’s uncle and her mother Anna’s brother. 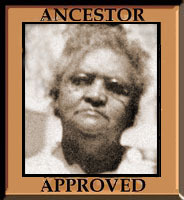 I had never found any relatives for Anna except those of her mother and children. Anna’s maiden name was given as “Ray” on some of her children’s records. I looked some more and found Thomas Allen’s Will. It said he used to go by the name of “Ray” which was his former master’s name but he changed it to “Allen” after he got out of the service (he gave his unit as 5th US Colored Calvary). In the military record, there is his former slave holder’s full name! Now this particular branch of the family was very close mouthed about anything to do with slavery, although they did mention those Cherokee Ancestors who passed on no DNA. So, from looking for some info for my book about my grandfather’s letters, I found a new ancestor; my first United States Colored Troops family member; the last slave holder for that particular branch of the family and who the person was at that N. Capital St. address. I, Thomas Allen, a resident of Marion County, Indiana, and being of sound and disposing mind and memory, do make, publish and declare this to be my last will and testament, hereby revoking all former wills by me made. Item #1. I give and devise to my beloved wife, Kate Allen, the following described real estate, situated in the city of Indianapolis, County of Marion and State of Indiana, and described as follows: – Lot number twenty-five (25) in Ruddell and Vintons Park Place, Plat Book number four (4), Page one hundred ninety (190) in the Recorder’s Office of Marion County, Indiana. Item #2. I give and bequeath to my wife, Kate Allen, all of the personal property of which I may die seized. Item #3. I constitute and appoint Otts Delp executor of this will. Witness my hand and seal, this 23rd day of July, A.D., 1907, at Indianapolis Indiana. The foregoing instrument signed, sealed and acknowledged by said Thomas Allen as and for his last will and testament in our presence, who, at his request, and in his presence, and the presence of each other, have subscribed our names as witnesses there to, this 23rd day of July 1907. Subscribed and sworn to before me, this 23rd day of July, 1907. Otto Delp being duly swornm on oath says that Thomas Allen departed this life on or about the 10 day of November 1907 and at the time of his death was a resident of said County and State. Very interesting, especially the part where he explains his name. 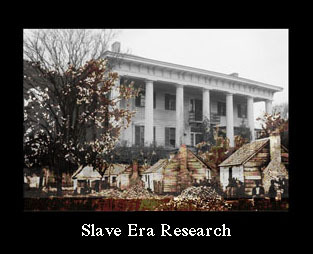 That was interesting and I also appreciated the name of the slave holder and that he was in the USCT. Wow. It makes him seem more real…which is kind of weird but it does…. And the part where he is explaining about his name made me feel – well, related- I mean you know I totally get what he’s saying and could see myself explaining it that same way. I can see how it makes him more real. Anything that gives us some information about who he was and why he did anything does that. What an unusual item to find in a last will and testament. This will was written in a much more personalized style than any of the others I have, which are pretty much forms with the information slotted in. At least that is how they read. I wish more people had put this kind of information in their Wills! Would make my search so much easier. It is listed on his USCT pension cards, the name change, but not the reason. I might not even have found his service records if he hadn’t told us what name he used to go by. Congratulations on finding more information about Anna’s family. The will is a treasure. Best Will I ever had, in positive way. What a GREAT find Kris! I KNOW Jan! Whooo hooo! !